We sailed right by our goal of 50,000 participants. 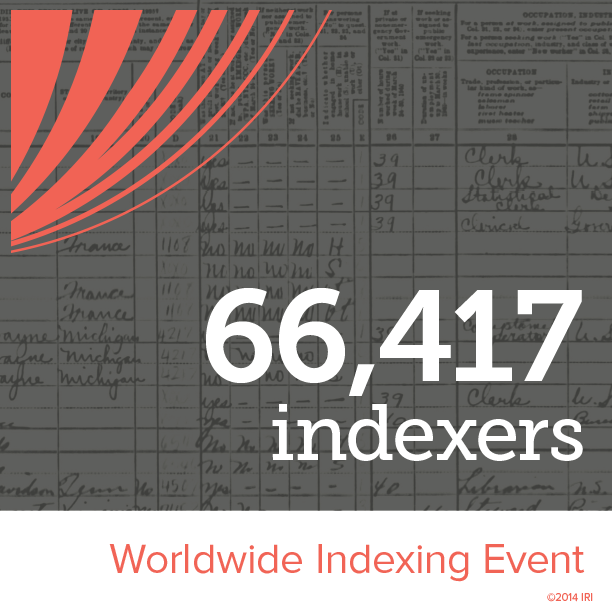 Official numbers will be released tomorrow but the image above shows that according to the Facebook Event, we hit about 66,417 indexers. I slept last night through the first part of the GeneaSleepOver, but Dear Myrtle was a true genealogy champion and made it through the entire 24 hours awake! I did my part and arbitrated 2 batches. I wish I had time to do more, but the kids and other commitments kept me too busy. Everyone should be proud to have contributed to this very worthwhile event! I conduct genealogy research pretty much every single day, and I use FamilySearch.org pretty much every single day that I conduct genealogy research, so arbitrating when I can is the least I can do. I hope everyone who contributed to the Event will continue to contribute when they can. We indexed millions of records in 24 hours, but there is still so much to be done! Congratulations and thank you to everyone who submitted at least one batch during this Event, we have made history!